Extreme heat is a significant public health challenge in urban environments that disproportionally impacts vulnerable members of society. In this research, demographic, economic and climate projections are brought together with a statistical approach linking extreme heat and mortality in Houston, Texas. The sensitivity of heat-related non-accidental mortality to future changes of demographics, income and climate is explored. We compare climate change outcomes associated with two different Representative Concentration Pathways (RCPs), RCP4.5 and RCP8.5, which describe alternate future scenarios for greenhouse gas emissions and concentrations. For each RCP, we explore demographic and economic scenarios for two plausible Shared Socioeconomic Pathways (SSPs), SSP3 and SSP5. Our findings suggest that non-accidental mortality in 2061–2080 may increase for all combinations of RCP and SSP scenarios compared to a historical reference period spanning 1991–2010. Notably, increased heat-related non-accidental mortality is associated with changes in the size and age of the population, but the degree of sensitivity is highly uncertain given the breadth of plausible socioeconomic scenarios. Beyond socioeconomic changes, climate change is also important. For each socioeconomic scenario, non-accidental mortality associated with the lower emissions RCP4.5 scenario is projected to be 50 % less than mortality projected under the higher emissions RCP8.5 scenario. 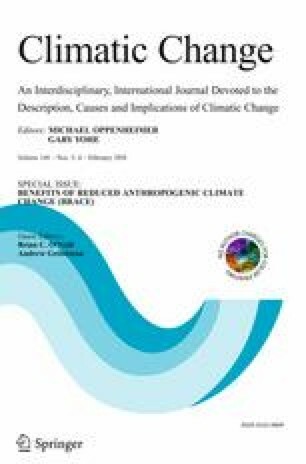 Submitted to Climatic Change as part of a Special Issue on the Benefits of Reduced Anthropogenic Climate changE (BRACE). The online version of this article (doi: 10.1007/s10584-016-1775-1) contains supplementary material, which is available to authorized users. This research was supported by the National Aeronautics and Space Administration (NNX10AK79G) and the National Science Foundation (NSF) Research Network on Statistics in the Atmosphere and Ocean Sciences (DMS-1106862; DMS-1417856). The National Center for Atmospheric Research (NCAR) is sponsored by NSF. Brian O’Neill provided data for the demographic projections. The CESM project is supported by NSF and the Office of Science (BER) of the U.S. Department of Energy.